This walkthrough demonstrates how to use pass-through services and operations. This walkthrough makes use of some free services provided by the openweathermap.org server and the www.webservicex.net server. Neither of these servers is associated with InterSystems Corporation and these servers may not always be available. If they are not available, you can substitute any other REST or SOAP server available to you. The openweathermap.org server supplies free weather data. If you intend to use it in an application, you should get a application ID. Although the service is free, product support is available for the weather server at a fee. See http://openweathermap.com/ for more information about this server. The www.webservicex.net server is provided by Cloud Computing Technologies Ltd. This section adds a REST pass-through service and a REST pass-through operation. The service listens on the Web port and sends the HTTP REST message to the pass-through operation. 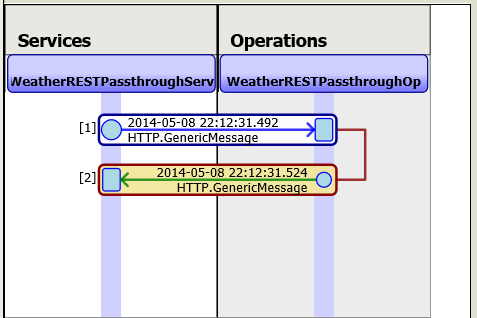 The pass-through operation sends the HTTP REST message to an external server, api.openweathermap.org, that returns current weather information. Select or create a namespace and production. In order to use the Web port, you must define a web application in the namespace and a role. See “Configuring an InterSystems IRIS System” for step-by-step instructions to create a namespace, role, and web application. For this walkthrough, name the web application /restpassthrough (web application name should be lower case) and set the web application Dispatch Class to EnsLib.REST.GenericService. On the production configuration page, select the plus sign for adding new operations. Name the operation, such as WeatherRESTPassthroughOp. Select the Pass-through operation that you created and select the Settings tab. Leave the other fields at their default values. Check the Enabled check box. Select the plus sign for adding new services. Name the service, such as WeatherRESTPassthroughServ. Select the Pass-through service that you created and select the Settings tab. Ensure that the Port number is blank. In the TargetConfigName field, choose the pass-through operation that you added in the previous step. In Connection Settings, check the Enable Standard Requests check box. In Additional Settings, set Pool Size to 0. This suppresses the pass-through service from listening on the special port. If do not set the pool size to 0, you must specify a port number. http://localhost:nnnnnn/ where nnnnnn is the default Web port. web-application-name/ that you specified. See Configuring a Web Application for a Pass-through Business Service. URL required by the external service, such as data/2.5/weather?q=London,uk. Note that all alphabetic characters in the web application name must be in lower case and the pass-through service name must match the case of the configuration item name. The last parts of the URL starting with data are identical. The HTTP Server field sets the server in the outgoing call. The | in the URL field instructs the operation to strip the web application name and configuration name from the incoming URL and then include the remainder in the outgoind URL. The EnsLib.REST.GenericService class does not provide any additional functionality over the EnsLib.HTTP.GenericService class. Although you could use the EnsLib.HTTP.GenericService class to pass-through a REST call, you should use the appropriate subclass. There are a few troubleshooting steps you can take if you don't get the expected results. This ensures that the weather server is working correctly. The trace may help you identify where the error is. The TCP trace should show the HTTP request being sent out by the pass-through operation and the server's response. This section adds a SOAP pass-through service and a SOAP pass-through operation. The service listens on the Web port and sends the SOAP message to the pass-through operation. The pass-through operation sends the SOAP message to an external server, www.webservicex.net, which among other services provides a currency conversion service that returns the exchange rate for two specified currencies. In order to call the SOAP passthrough services, you need to use a SOAP toolkiit, such as SOAPUI. For information on the SOAPUI toolkit, see http://www.soapui.org/. Select or create a namespace and production. In order to use the Web port, you must define a web application in the namespace and a role. See “Configuring an InterSystems IRIS System” for step-by-step instructions to create a namespace, role, and web application. For this walkthrough, name the web application /soappassthrough and set the web application Dispatch Class to EnsLib.SOAP.GenericService. Replace the two question marks with the abbreviations for the currencies. For example, to convert Euros to US Dollars, replace the first question mark with EUR and the second question mark with USD. This section adds a SOAP passthrough operation and a SOAP passthrough service that use the Web port. Go to the Production Configuration page and select the plus sign for adding new operations. Name the operation, such as ConvertCurrencySOAPCSPOp. Name the operation, such as ConvertCurrencySOAPCSPServ. Ensure that the Port field is blank. Set the TargetConfigName to the passthrough operation that you created in the previous step. In Additional Settings, set Pool Size to 0. This suppresses the passthrough service from listening on the special port. URL required by the external service, such as CurrencyConvertor.asmx. Then execute the request. The SOAP toolkit should return the same XML message that it previously returned.